For our first Valentine’s Day as a married couple, J and I are doing a lot of things that we did for our first Valentine’s Day together. The presents are similar although there were a few extras this time and our dinner plans include an Italian restaurant. That first Valentine’s Day was just three short years ago when we still lived in Peoria, IL….well, actually Morton, IL (yes, the home of Morton Buildings), but we worked in Peoria….well, ok, we actually worked in Creve Coeur, IL (which means heartbreak or sad heart in French…funny, huh?). Both are “suburbs” of Peoria. We had been dating for six months and were well aware that a big move was probably in the near future. I know it sounds crazy, but I knew that J was “the one” and even though the thought of moving scared the crap out of me, I never thought twice about it. We spent that first Valentine’s Day at an Italian restaurant in Peoria that I had wanted to go to since I had moved to town five years early. Rizzi’s on State was the name of it. It’s in this great old building on Peoria’s Riverfront. We had a late reservation and we both had to work the next day, but it didn’t stop us from enjoying what would be the first of many. Fast forward to 2010. The first Valentine’s Day since our September wedding. Since we’re still fairly new to Kalamazoo, I didn’t really know where to book a reservation. I had seen Zazio’s on TV and seen the billboards around town. We both like Italian, so I made the res. 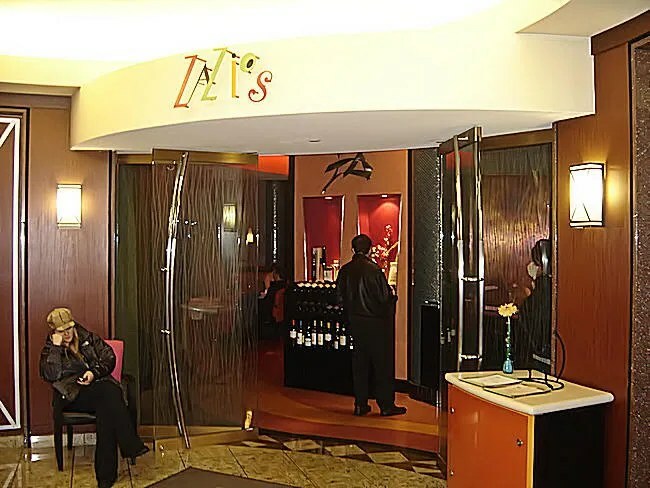 Zazios is located inside the Radisson Hotel in downtown Kalamazoo on Michigan Avenue. We parked at the parking deck across the street from the Radisson (which is validated by the restaurant) then took the sky bridge from the ramp to the hotel. 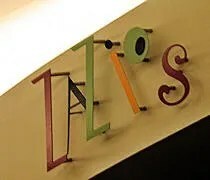 To get to Zazios, you have to go down to the main floor then follow the signs is the best way I can describe it. You go back past Burdick’s to find Zazios at the end of the hallway. One of the big advantages Zazios had in getting my reservation is that they take online reservations on Opentable.com I’m one of those people that really don’t like talking on the phone, so the more I can do online, the better. I use Open Table almost anytime we eat at a fancy place in Chicago, so the familiarity of seeing a local restaurant take advantage of this easy-to-use website was a big factor in my decision. Our reservation was for 6:30 and we walked in about 6:33. I hate being late for a reservation, but three minutes isn’t so bad. It took us a while to find parking even in the garage. The restaurant is really interesting. The colors are all very bright yet subdued by the mood lighting. There are tables all over the place and if you keep going back, there’s a little theater where the TV show is shot. The rest of the time, the area is used as the “Chef’s Table” where you can get dinner and a cooking demonstration for $55. We were shown to a table for two along one of the walls in the middle of the space. One side of the table was bench seating we shared with two other tables. The other seat was a very plush chair that was more of a lounge chair than a restaurant chair. We’ve had seating like this before and it’s usually very uncomfortable. You hear all the conversations around you. This was not the case at Zazios. We were given a wine list when we sat down, but we never did get the martini list. Water was brought to us as well as bread. The bread was a mixture of flatbread and ciabatta. It was served with two spreads. One was an olive spread. The other was described to us as being similar to humus. Even though neither of us are wine drinkers, we both decided to drink wine tonight. Neither of us can look at a wine list and have any idea what we’re looking at. J took the lead on this one and ordered a glass of the Tiziano. I did the same. One option was to go for a four course meal for $65. We passed. The other option was a la carte which is more our style. We both started with the mista salad which the waitress described as their equivalent to a house salad. 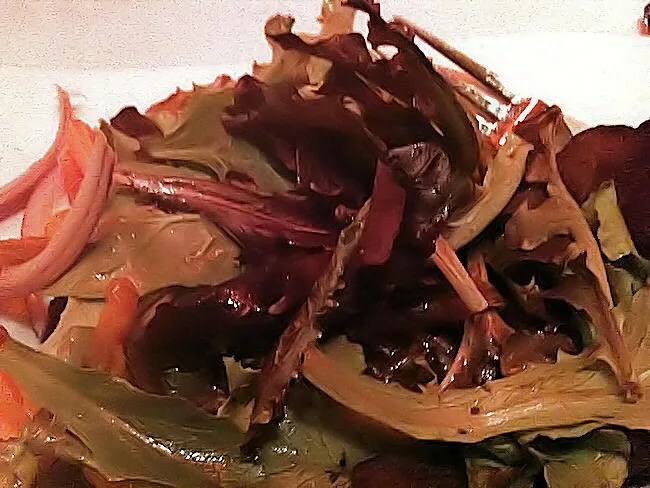 It is a mixed greens salad with carrots, roasted peppers, and onions with a basil red wine balsamic vinaigrette. The salad was probably the largest portion size of our meal. It was more J’s cup of tea than mine. It had a really strong onion flavor even though I pushed the red onions to the side. After our salads, we waited quite a while for dinner. It was Valentine’s Day, so we didn’t really think much about it, but our waitress did come over an apologize. It was probably at least twenty minutes between courses if not more. For entrees, we both went with pasta dishes. I went straight for the Lasagna Bolognese. Even though the portion size was pretty small, it was incredibly delicious. The fresh egg pasta was layered with a creamy Parmigiano besciamella and topped with a classic Bolognese sauce. 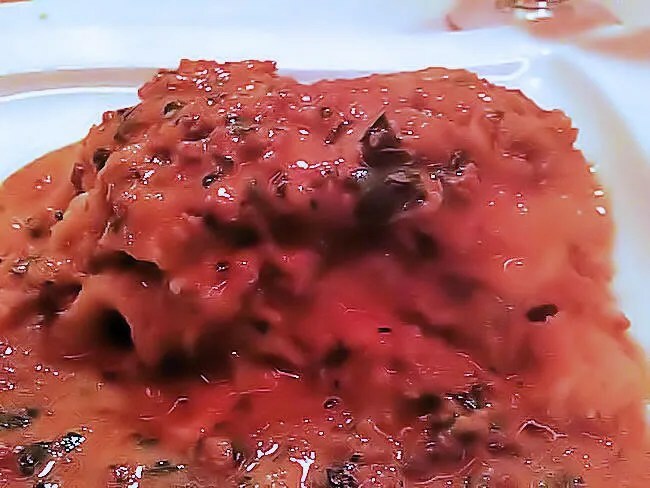 It was so creamy and smothered in the sauce. Neither one of us had eaten much before we went to dinner and we polished off the pasta in record time. It was so good, I didn’t even realize how fast I was eating. I just wanted more. The pasta was so soft. It makes me think I’m doing something really wrong when I make pasta at home because this tasted nothing like mine. 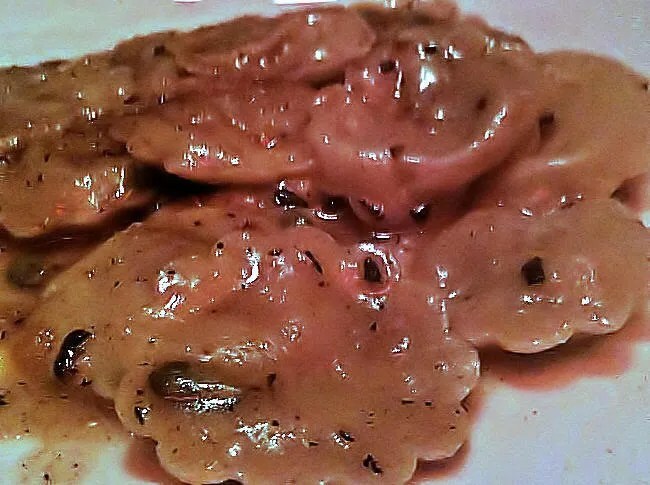 J ordered the Cappelacci which was a ravioli stuffed with butternut squash, pumpkin seeds and cheese then finished in a brown butter sauce. Again, portion size was smaller than we expected, but she loved the pasta. She said the squash and brown butter gave the pasta a sort of sweet taste. I say the portion was smaller than we expected, but it was the perfect entrée size for her. We both assumed there would be some extra to take home, but that was not the case. She couldn’t stop eating it. Dessert came about twenty minutes after our entrees. Our waitress suggested we put in the order at the beginning of the meal to try and keep things moving. I ordered the Cioccolato for J and I to share. 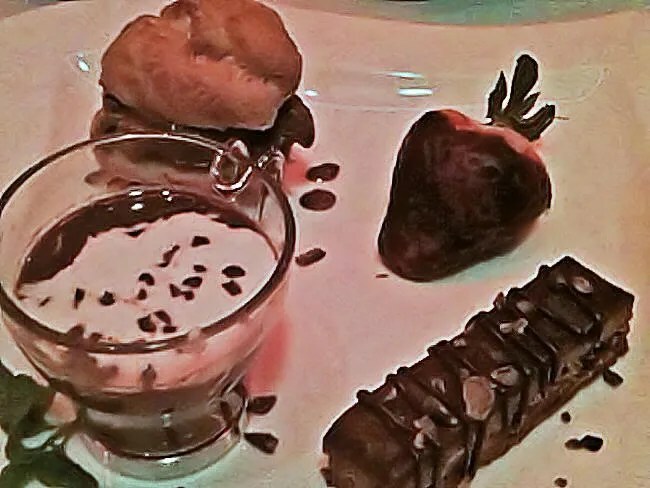 The dessert was a like a little chocolate tasting. There were four desserts on the plate that we split up…well for the most part. I don’t like strawberries, so J got the chocolate covered strawberry all to herself. The other three creations were a puff pastry filled with a Venezuelan Chocolate gelato, a chocolate bar, and a warm chocolate mousse. Everything on the plate was delicious and the perfect cap to our meal. The bill came in just under $70 with the three courses (dessert was split) and two glasses of wine. When I pulled my phone out at the end of the meal, I was a little shocked to see it was almost 8:30. I had thought about making plans after dinner, but it’s a good thing I didn’t. I would have thought an hour tops, but I would have guessed wrong. Other than that, we loved our meal. It’s something that is way out of our element and something we don’t do often, so when we actually do go out for a nice meal, it’s even more special. I think I made the right choice for our first married Valentine’s Day. I apologize for the picture quality. I must have left my digital camera on overnight and when I took it out to snap pictures, it didn’t want to turn on. We had to use J’s iPhone and there’s not much light at the table. I’m embarrased and wish I could have really shown you how great our meal was.